We help you get clients using effective internet marketing and optimized website designs. 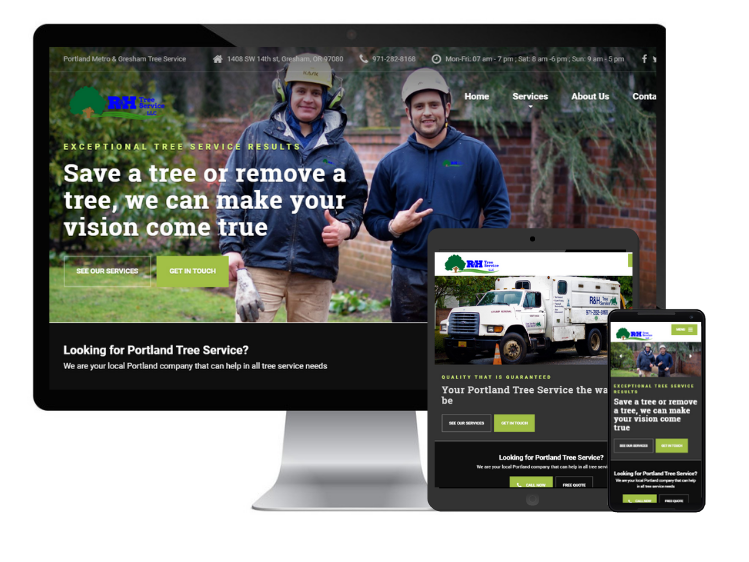 The R&H Tree Service website was stuck in the last decade and managed by a lead generation website so there was no real personal feeling to it. We worked closely with the owners of R&H to understand their vision and to develop a modern and effective image for their internet marketing campaing. See if you can find them on the first page of Google by typing "Gresham Tree Service". A website is to be used as a sales force to get you quality leads and new clients 24/7. One of our areas of expertise would be Portland website design and SEO. Led by a dedicated team of web design professionals, the Portland SEO experts at Forza Digital Marketing work with you to develop responsive and effective websites that will give you a respectful online presence. Imagine having the power of Google to help bring a predictable amount of quality traffic and clients to your business. Customers are searching for your products and services everyday and for that reason your website design needs to be optimized so that Google ranks it on the first page. 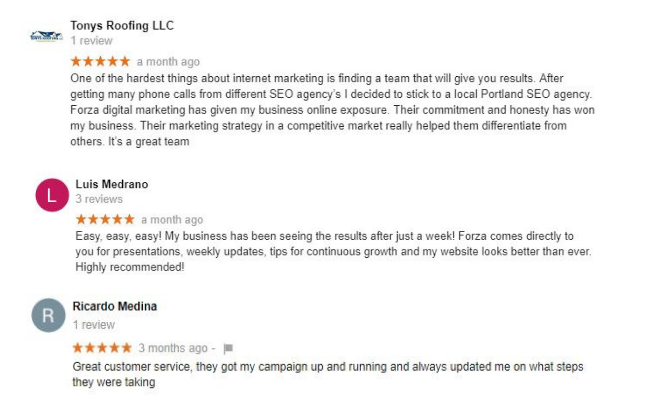 Forza Digital Marketing is your Portland SEO company that delivers predictable results. Because after all, what good is having a website if nobody knows it exists? Use SEO to get your website to the front page of search engines. Today, companies, big or small, know that to reach a target audience, we have to invest in social media marketing strategies. This way, we can make our products and services known not only offline but online as well. Forza Digital Marketing is your expert Social Media Marketing Portland with proven strategies that find your target audience and turn them into customers. Using the immence database from Social Networks like Facebook that allow to laser target a desired demographic. In this new digital age Reputation Management can make or break a business. Being able to interact and see what your customers are saying can be time consuming and overwhelming. Utilizing software, our agency is aware of all the reviews, posts, tweets etc. that mention your name keeping a positive sentiment in your community. Positive reviews also help with nudging new customers towards your services and help with SEO. Ask for your Free Website Audit, to find out how to take your business to the First Page of Google! We create an online marketing system that works tongether in order to achieve effective converrsions. We have developed a predictable traffic generation system that will allow you to scale your business fast and efficiently! Why Hire a Professional Portland SEO Consultant? Finding a good SEO company can be a little hard especially in today's age when telemarketers are bombarding business owners with phone calls every hour. It's hard to tell who is just trying to speak themselves into a sale and who will actually deliver on what they promised. When we at Forza Digital Marketing Portland take on a project, it becomes personal, We never outsource our work as it is done in house to ensure quality. This is why we have a high standard on the websites and digital marketing services that we deliver and our clients are happy so far. To learn more or if you have questions on how to get started, take the first step and contact us for your free consultation. As a full service internet marketing agency we can handle establishing your online presence from the ground up, or from the website development and up. 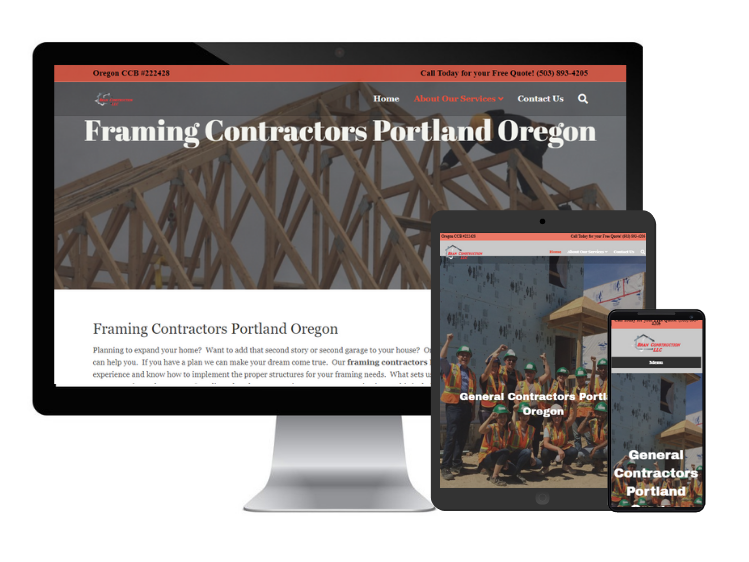 Our Portland website design methods come integrated and are built optimized from the beginning which will expedite and speed up the time it takes to get your website to the first page of Google. We can create a brand new website if you don't have one, or re-design an existing one to bring it up to date. We believe in only delivering high-quality websites and won't stop working until you are completely satisfied with it. Revisions are part of the process so we work very closely with you to establish a relationship with open communication in order for us to deliver the best webdesign for you. Forza Digital Marketing specializes social media marketing that is effective and won't be a waste of resources. We continually monitor and optimize running campaigns in order to push our resources towards the most effective outlets and demographics that we are targeting for your campaign. We are well versed in Facebook ad management and can run e-commerce ads in order to spread awareness about your store and products or local business with top results. Forza Digital Marketing are Portland SEO experts that specialize in planning and executing internet marketing campaigns for small businesses and enterprises. Our predictable traffic generation system consists of organic traffic from search engines such as Google, Bing and Yahoo. We also assist our clients with social media marketing, pay per click advertising (PPC), email marketing and much more. If you already have an in-house marketing team, then our Portland SEO consultants can gladly come and still assist your business collaborating and develop a strategy with them to bring you results. The internet has grown and along with it so has the internet marketing platforms, you can read more about our services here.